Details about the perpetrator of Wednesday’s bloodbath echo those of many mass shooters. Lopez reportedly purchased the gun he used, passing a background check, in nearby Killeen, Texas. 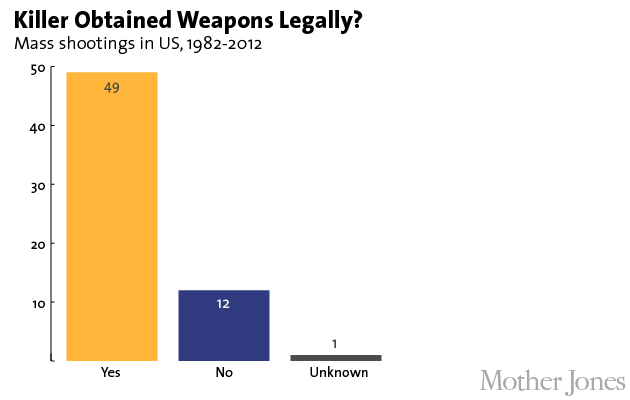 The overwhelming majority of mass shooters in the scores of cases through 2012 obtained their weapons legally—nearly 80 percent of them. And the mass shooters in all five of the additional cases last year, from Santa Monica to the Washington Navy Yard, also got their guns legally. Lopez used a .45-caliber Smith & Wesson in the attack. Semi-automatic handguns are the weapon of choice for most mass shooters. It remains unclear how many shots Lopez fired or what type of ammunition device he used, but given his military background and the casualty count, it’s more likely than not that he used a high-capacity magazine. As our study showed, the vast majority of mass shooters were men, ranging from young adult to middle-aged. Their average age was 35. Lopez was 34.
the haunting repeat of such gun violence at Fort Hood means that in the days ahead there will be intense scrutiny on security protocols at the sprawling military site, including what has or hasn’t changed since 2009. But in terms of getting a handle on the perpetrator and the crime, investigators already have a lot to go on from scores of cases all over the country. For much more of our reporting on mass shootings, gun violence and gun laws, see our full special reports: America Under the Gun and Newtown: One Year After.